Ethan (age 4) loves to do and play with “big” kid things. He has become quite adept at maneuvering around on the computer and loves to play a few video games on the Wii with his siblings. I have seen the look he gives his older brother when he plays handheld video games so when the Mobigo 2 came out I knew we had to try it. 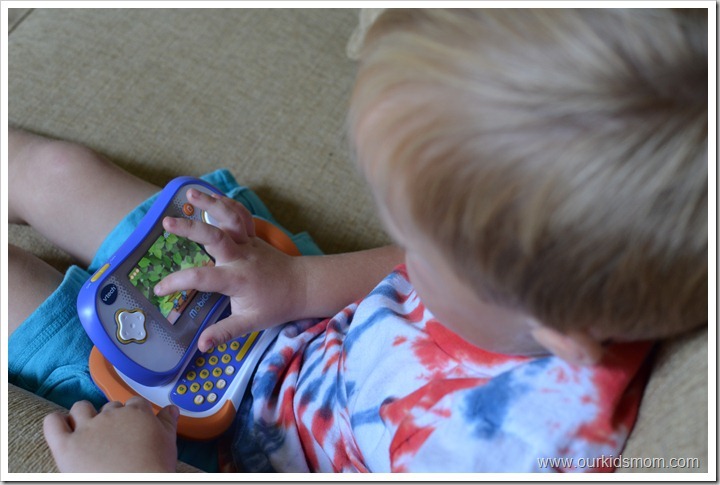 What I love about the new MobiGo 2 Touch Learning System is that it is a multi-functional, educational handheld system that allows kids ages 3-8 to enjoy on-the-go play and hone their creativity. Kids will learn basic skills such as math, vocabulary, spelling, reading, logic, drawing and more. 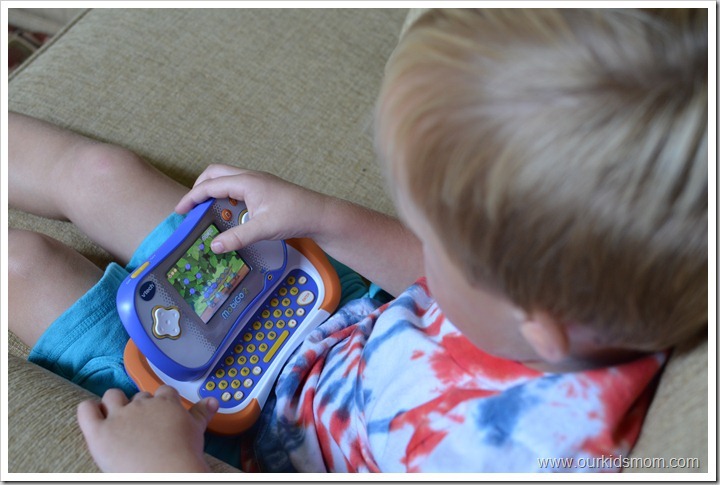 The QWERTY keyboard also helps kids become familiar with a keyboard layout. If you’ve had the opportunity to play with the original Mobigo you will find the same features on the new version as well. Even the old games work in the Mobigo 2. MobiGo 2 comes equipped with a NEW motion sensor and microphone in addition to the touchscreen. 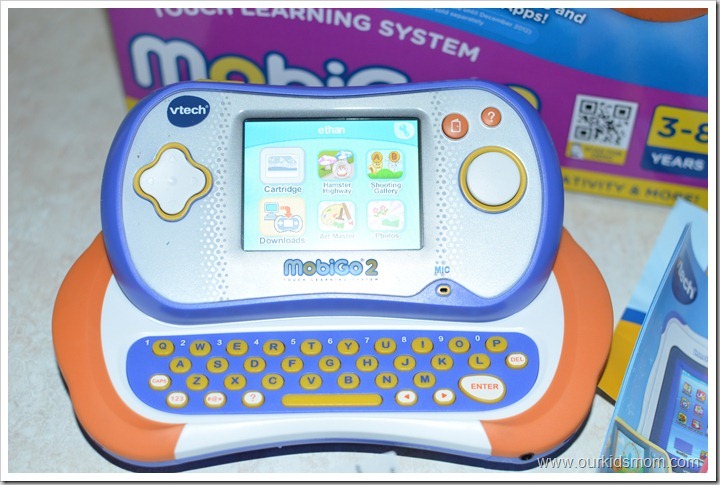 Ethan likes to have his Mobigo 2 open every time he plays whether he needs the keyboard or not. I think he likes the angle it puts the screen at. He quickly adapted to the touch screen because of his previous iPod and smart phone use making getting around the Mobigo 2 almost intuitive even though he is not a reader yet. Here you can see an older game inserted in the system on the top. 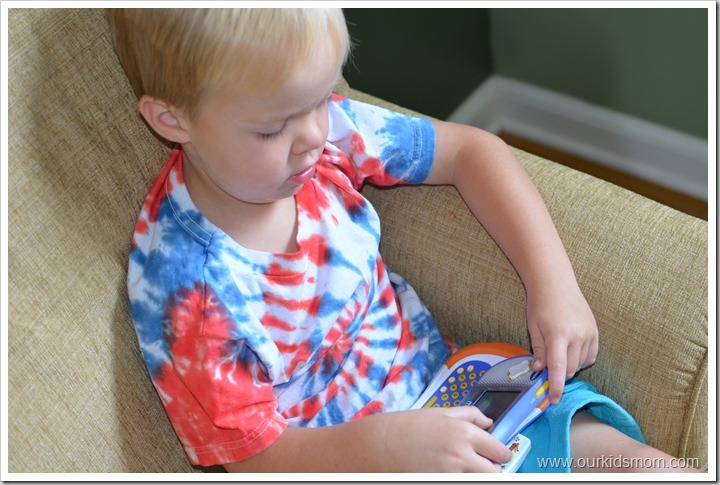 What I love about the Mobigo 2 is that there are over 80 learning apps you can download … this is fabulous news for kids like Ethan that tend to misplace (mindlessly set down) games around the house. All of the games are stored in the internal memory and easily pulled up at your child’s whim. I love the multi-functionality of the MobiGo 2. It can be used as an e-reader, photo album, photo viewer, art studio and coloring book, as well as an educational game player. It is a great value as it comes pre-loaded with three great games that take advantage of the product’s many features. We downloaded a few games and Ethan fell in love with Ant Harvest (a counting game) and Shopping Spree (a matching game). He also likes the art gallery for coloring/creativity. I found the Mobigo 2 to be the perfect size to bring anywhere… perfect for on-the-go use. Ethan loves to play it in the car, at the grocery store, in waiting rooms… practically anywhere! It’s small and light enough for me to toss into my bag and with most of his games loaded internally I don’t have to worry about him losing the cartridges. He can get around on the unit by himself because of the short tutorials before each game, the controls/buttons (on/off, sound, home) are large enough for chubby fingers to use and the edges of the unit are rubberized to help absorb shock when accidentally dropped. At a $59.99 price point and most apps priced at around $2.99 (and sale prices of only .99) I would highly recommend the Mobigo 2! 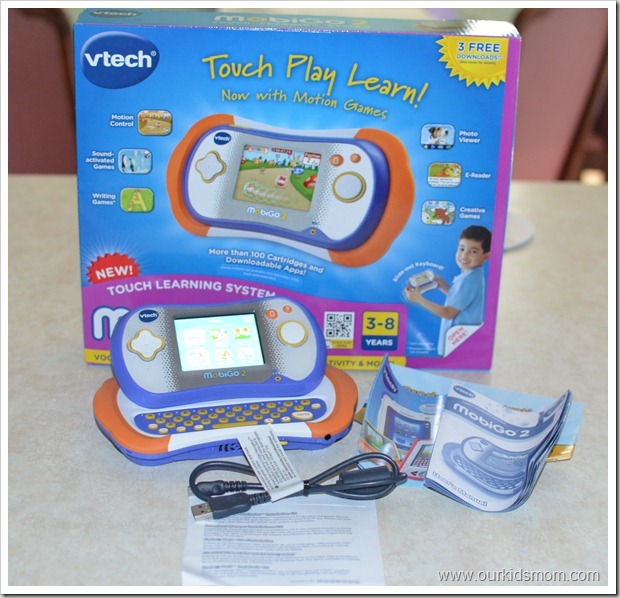 I participated in a campaign on behalf of Mom Central Consulting for VTech. I received product samples to facilitate my review. The mobigo is so awesome. I would love to get one and have it for the granddaughters while they are here at my house. Great learning fun. My 4 yr old has a Mobigo and he loves it. The Mobigo 2 looks amazing. I love that it can be an ereader.